If there's on thing we love to see, it's the absolute saints that take it upon themselves to combine our favourite eats with our favourite drinks to create the ultimate mouth fodder. Food 2.0 if you will. So when we discovered the people at Drunk Jelly had created a collection of spreadable jams using our favourite drink of all time (all the wines), then we knew it was to be our favourite condiment of all time. Imma put it out there: I think jam is a waste of time. Like, wtf is marmalade? It's bitter and has bits of orange rind in it, which is the one bit of the orange that you're told not to eat under normal circumstances. And it ruins perfectly good savoury snacks - I'll just stick to my PB sammy without the J, thank you very much. 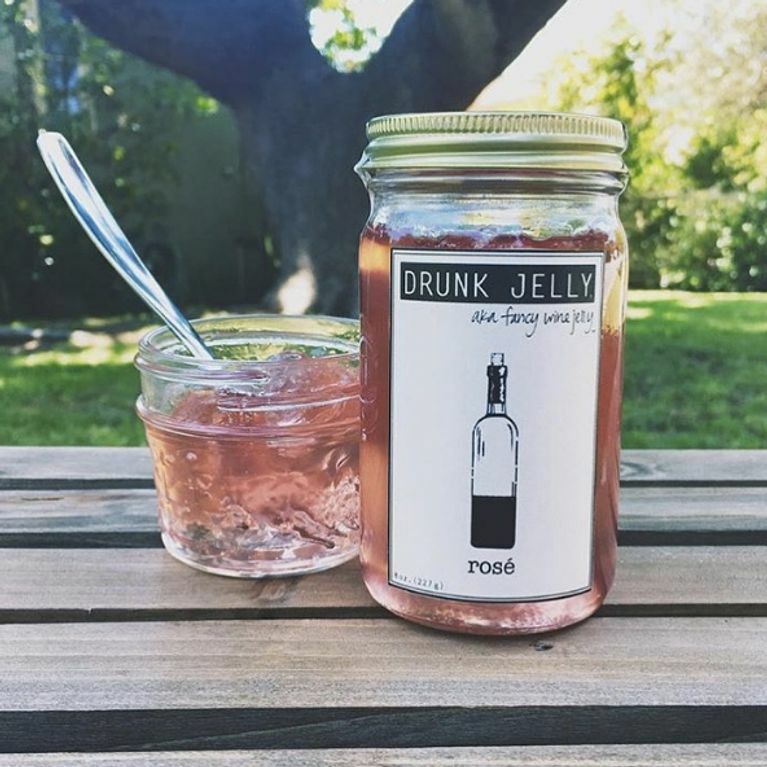 UNTIL NOW: Drunk Jelly is the product of an idea that founders Marty Millman and her boyfriend Danny had whilst having a picnic over wine and a charcuterie board. "Any excuse for adding more wine to our day seemed like a no-brainer," their website says. "It led us on a journey to create the most tasty wine jelly ever using our favorite wines." Drunk Jelly comes in seven flavours: Rosé, Moscato, Cabernet Sauvignon, Merlot, Moscato, Pinot Grigio, Chardonnay and Pinot Noir. According to the product description, the rosé has flavours of "cherry, watermelon and a hint of lime", while the merlot tastes like "cherry, boysenberry, plum, and chocolate with a mocha finish". And if you don't fancy trying it on toast, they even give you serving suggestions, like swapping out the cranberry sauce at Christmas dinner in favour of the merlot, or subsituting hot fudge for the moscato next time you fancy a sundae. And you don't need to worry about drink-driving to work after slathering it on your morning slice - although inspired by the flavours of your favourite wines, these jams are actually non-alcoholic. Even more reason to indulge, right? Drunk Jelly pots come in two different sizes: 4oz or 8oz, priced at $6 or $9 respectively, or they come in mix 'n match batches of four or eight, or you can get all seven flavours if you fancy a taste of 'em all. Unfortunately they're only available in America right now but if 'Murica do the right thing and buy all wine jams there are, then fingers crossed they'll be arriving in the UK in no time.